The art of renewal was in fashion since a long time. Junk art to junk fashion ,the twenty first century, that is the junk generation has it all in them to recycle and reuse old thrown away stuffs and that too use them in a superb stylish way that makes the fashion world go into a whole new frenzy. The junk fashion is doing the rounds in the fashion world for quite some time now. The fashion changed but this art remained evergreen. As fashion changed with each passing day, this art was also incorporated in every changing fashion and has been enjoying the lime light constantly for a long period of time. The junk art has stated way back in history and has travelled across the globe for a long time. It has been accepted and well adopted all over the world. This form of art is being promoted and is an important part of the fashion and art world. The designers are way impressed with junk fashion. This kind of fashion that is junk fashion is trending high (no not on twitter or face book, in reality, in the fashion world).Every fashion show has some or the other item and at times majority of the items, based on junk fashion. There was a time when junk fashion was restricted only to the female species. Now it’s there even for the metro sexual men. Now it’s unisexual. 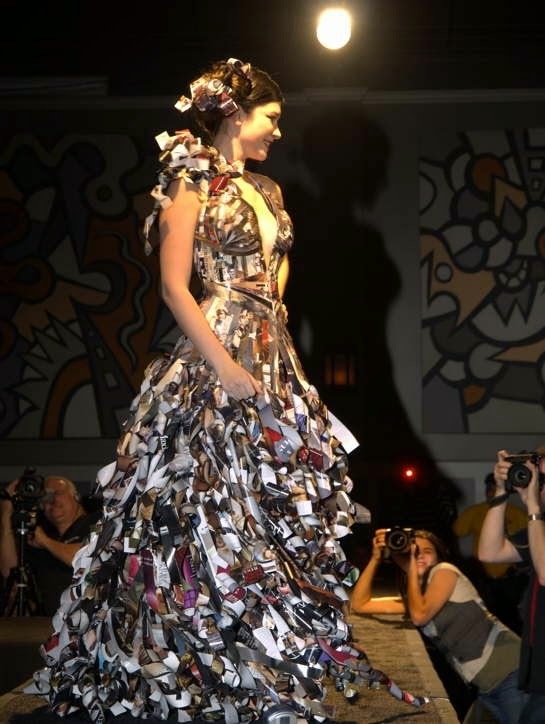 Junk fashion has had quite an impact on the fashion world and the fashion designers. The fashion world loves it and cherishes it why the designers try to explore it and revive it and innovate to suit their needs and style. The public are very much in love with junk fashion and these stuffs are greatly in demand. The junk fashion comes cheap and therefore doesn’t burn much big a hole in your pocket. Being wallet friendly, it appeals to the teenagers and students who form the main majority of the fashion following crowd. May the junk fashion live long? Well this fashion is here to stay and capture many hearts. WRAPPING UP AGAINST THE COLD! Spring Summer Fashion Forecast “2013” – colors – styles – print details for ladies outfits. Spring Summer Fashion Forecast “2013” – theme-1 - Contemporary Fashion – Modern styles. Spring Summer Fashion Forecast “2013” – theme-2 - Modern Artisan – Mood board – color themes – style details – print / application details – other embellishments.